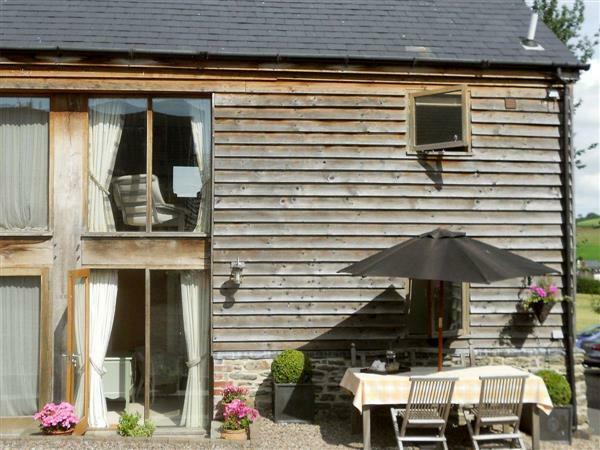 Bushel Barn in Titley, near Kington sleeps 4 people. 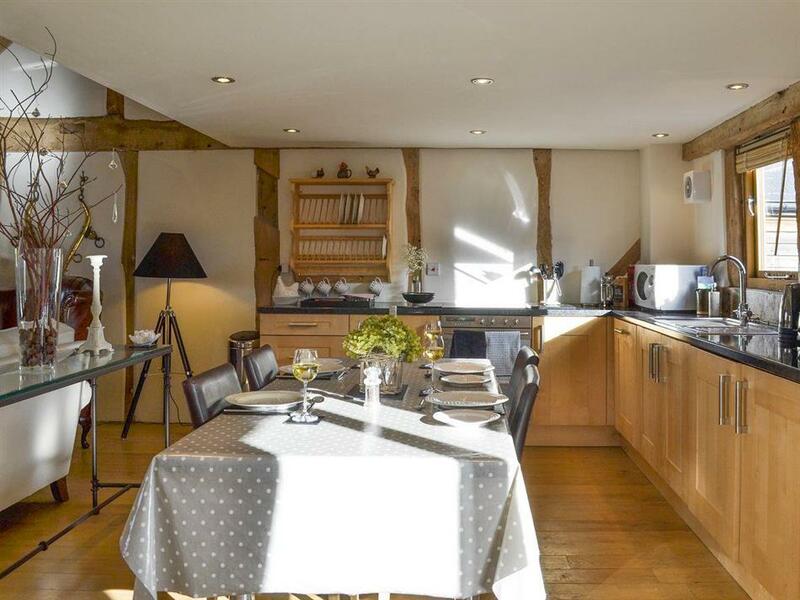 Bushel near Kington is a beautiful barn conversion which is positioned adjacent to a nature reserve with glacial pools. It provides a great base from which to explore Hay-on-Wye, the Brecon Beacons, Hereford and Ludlow. Furnished in a boutique, hotel style, it blends both traditional and contemporary features, to provide a relaxing base for those who seek peace and tranquillity from their holiday. The open plan living space is on the first floor to take advantage of the dramatic vaulted ceiling with gallery above. The living area is comfortably furnished, with a Laura Ashley sofa and Gentlemen’s club-style, leather armchairs. The bespoke sycamore kitchen looks out over the courtyard, where you can watch the house martins flit around the eaves whilst you cook. The kitchen is well-equipped with Sophie Conran china and food processors and blenders, to ensure you have everything you need for your break away. The owner has also provided cookery books, to give you a little inspiration when making your evening meals. Overlooking the living area is a galleried room, which is great for teenagers to get away and have their own space in the eaves. Outside, Bushel near Kington has a private garden to the front, which overlooks the open fields and hills, with table and chairs for four and a lawned area. To the rear is a communal courtyard, which is a real sun trap, and in warmer weather you can listen to the gentle creaking of the barns. Sit down and relax whilst immersing in this completely tranquil environment. There is a hidden gem of a nature reserve adjacent to the barn, where you can walk or picnic in the meadows that are full of wild flowers. Watch the rich bird life from the hide that overlooks the lake, and with the owner providing a rug and basket, you can enjoy a romantic picnic for two whilst watching the sun set on an amazing day. A Michelin starred restaurant is just around the corner, so you can be assured of an excellent meal for when you do not wish to cook. This property has everything you need to enjoy a relaxing break away. The nearest shop is 5 miles, with the pub and restaurant 150 yards from Bushel near Kington. Bedroom 1: With four poster king-size bed and en-suite with shower over bath, toilet and heated towel rail. Bedroom 2: With four poster double bed and en-suite wet room with shower and toilet. Living area: With 39 Freeview TV and DVD player. Kitchen area: With electric oven, electric hob, microwave, fridge, freezer, dishwasher, washing machine and patio doors leading to courtyard. Oil underfloor central heating, electricity, bed linen, towels and Wi-Fi included. Travel cot, highchair and stairgate. Welcome pack. Garden with sitting-out area and garden furniture. Small enclosed courtyard with patio, garden furniture and barbecue (shared with other residents). Private parking for 1 car. No smoking. Holidays at Bushel Barn run from Friday to Friday. For a better idea of where Bushel Barn is, you can see Bushel Barn on the map below. Bushel Barn is in Herefordshire; should you be on the lookout for a special offer, you can find all the special offers in Herefordshire. It's always worth checking to see what is on offer at the moment. Do you want to holiday near Bushel Barn (UKC1048), you can see other cottages within 25 miles of Bushel Barn; have a look to find your perfect holiday location.